[asa book]B00W8CZTTA[/asa] Egg cleansings are an ancient form of shamanic healing practiced in Mesoamerica by curanderos (healers). In an Egg Cleansing or La Limpia, the shaman runs an egg over their client’s body to release energies due to illness, stress, stagnation, stuck places and much more. For the first time, this ancient shamanic healing method, egg cleansing, is now being shared in a book by Kalyn Raphael. Shamanic Egg Cleansing offers everything you need to know to conduct your own egg cleansings. 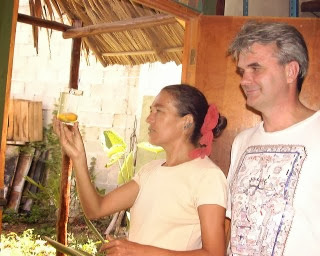 Egg cleansings (Limpia de Huevos) are a unique shamanic healing form which use an egg and smoke to energetically cleanse a client’s aura and to help them on their healing path. After a session, the egg is dropped into water and read. True seers have the ability to see the client, enabling the seer to facilitate the client’s understanding and ability to work with their own life issues. Would you like to learn this ancient art? Purchase Shamanic Egg Cleansing via Amazon (available in Kindle or Paperback). A bit mysterious, very unique, but very pleasurable, egg cleansings are form of healing still little known outside of Mesoamerica. For centuries curanderos, or shamans, have helped their people find spiritual, physical, emotional and mental health through their native ways. Their healing techniques are many, but one of the most powerful methods used by Mesoamerican shamans is the egg cleansing. Egg cleansings, or limpías, are a unique healing that works by running a raw egg over the body of the person being cleansed. As simple as this may sound, the effects are remarkable. The egg cleansing works to clear a client’s energy filed, ridding energetic and physical toxins. Clients are energetically opened and loosened, relaxed and brought to a more blissful state. Clients overwhelmingly report feeling physically lighter, happier and more balanced after a cleansing session. So, what is so magical about an egg? Egg cleansings are performed by shamans using smoke and an egg. Unlike most healing forms that move slowly or focus on one area of the body at a time, egg cleansings require constant motion as the shaman runs the egg over the client’s entire body. Between the egg and the smoke (traditionally incense from the dried sap of the Copal tree) that is blown over and onto the client, the cleanse works with both the energetic and physical aspects of the person. This is one of the great advantages to the egg cleanse – its beneficial affects work to touch the aura and the structured aspects of the client, (the structured aspects being the physical, emotional and mental bodies). One of the most magical parts of the egg cleanse takes place after the cleanse when the shaman reads the client’s egg. Kalyn, whose roots are part Mayan, studied with Maria, a local curandera in the Mexican Yucatan, where she developed her intuition to read the egg. Kalyn’s own cleansing work began after she worked with Mother Sarita, a well-known healer and curandera. Mother Sarita is the mother of the Nagual don Miguel Ruiz, best selling author of The Four Agreements. Kalyn’s studied with Don Miguel Ruiz as a spiritual teacher; she is a certificated teacher of his as well. In her training with Mother Sarita, Kalyn learned several shamanic healing techniques, but the egg cleansing was one of the most unique and effective. Both Maria de Tulum and Mother Sarita are curanderas con sabidura, or shamans with the ability to “see” beyond time and space. Kalyn now shares this ancient energetic healing in her new book Shamanic Egg Cleansings. Yes, you can. However, it is much easier to have it performed on you by someone else. healing could help remove the thought patterns that created the physical illness. Hello Lulu- yes, it is amazing & I too have done it on my pets. It truly helps them, as it does people! Reading the egg is very tricky. Yes, generally a clear glass signifies health. It’s wonderful that you have someone who does this for you! if the egg floats, do it again, if it sinks, you are done. Hi Jenna, I would suggest doing it again and seeing what you get. Should always want to feel better… Searched my whole life for “feel better”… Namaste!